We've been talking about external GPUs for a while, even before Apple decided to launch official support for the technology. As a result, we've used them all, and have a few we'd like to recommend if you're getting into the technology for the first time with your new MacBook Air or Mac mini. Editor's note: We ran this piece first in August shortly after the 2018 MacBook Pro was announced. Given that the new Mac mini and MacBook Air have Thunderbolt 3 ports, we've revised the piece to reflect that, and to refine data on a few choices. In short, an eGPU enclosure allows you to connect a powerful PCI-E graphics card to your Thunderbolt 3-equipped Mac in macOS High Sierra, and the forthcoming Mojave. Some are just the card, and some have additional connectivity. Of the 13 enclosures we've tested over the last two and a half years, we have a few favorites. 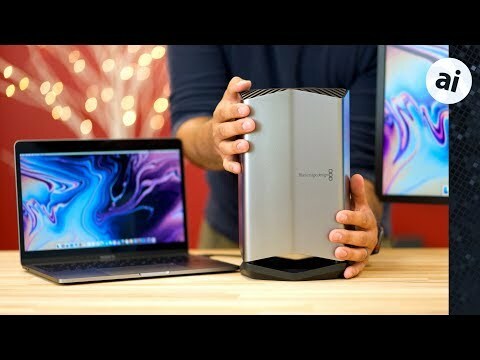 And, if you're like us, you can use the eGPU on your Mac to work during the day, and connect it to a Thunderbolt 3-equipped Windows PC for other purposes. But before we get going, a reminder that the 18-inch cable that comes with the enclosures is useless. They work, but they are universally just too short to be useful. Plan on spending $60 or so for a longer, high-speed cable. Sonnet wasn't first to market with an eGPU case, but they were the first one anointed by Apple -- and remain so. Sonnet's enclosure was used to demonstrate the technology at the 2017 WWDC, and was included in Apple's bundle that was sold to developers to get them on-board with the technology. There are a number of Sonnet eGPU enclosures now, but the best one is the Sonnet 650 with the beefier power supply. That enclosure, like the Razer, can take the cards that demand the most power like the Vega 64, and if you're adventurous, workstation cards or the Nvidia 1080ti. The Sonnet eGFX Breakaway Box 650 retails for $399. Other units with lighter power supplies suitable for the Vega 56 and RX580, and possibly less charging support for the connected MacBook Pro retail for $199 and up. Razer is a big name in PC gaming, and has recently decided to explicitly support Apple with some of its products, the Razer Core X being the most notable one. Core X is the first of Razer's Core eGPU lineup to feature Mac support, and sits below the Core V2 on the company's product totem pole. The enclosure sports a beefy 650-watt ATX power supply, up from the custom 500-watt slim form factor PSU found in the Core V2. To install a GPU, users simply slide the component drawer out from the aluminum chassis, pop a compatible card into the PCIe slot and lock it down with a thumb screw. No tools are required for installation. The Sonnet is a bit quieter than the Razer high-power eGPU is, but the Razer Core X is easier to get in and out of. It's really up to you which is more important. The Core X retails for $299. The $379 Mantiz MZ-02 eGPU enclosure has five USB 3.0 type A ports, a Gigabit Ethernet port, and a 2.5-inch mounting plate for a SATA drive. It can accommodate PCI-E cards needing up to 375W, and provides a full 87W of charging power back to the connecting computer, assuming it hasn't been adapted to an older version of Thunderbolt. Putting in a card is relatively easy, with a tool-less panel that pops off. The unit can accommodate cards up to 310mm long, 140mm high, and 50mm deep meaning that it will fit most of the larger cards on the market. It is the most stylish of all of the enclosures we've reviewed, and fits right in to a professional environment. The aluminum enclosure is constructed well, and finished precisely. The Mantiz Venus MZ-02 eGPU enclosure retails for $399, but is generally offered from Amazon for $349. If you're looking at a dock, you can get the Mantiz eGPU instead for not much more money. Accompanying the refreshed MacBook Pros in 2017, Blackmagic worked with Apple to develop an all-in-one unit, which sports an AMD Radeon Pro 580 GPU with 8 gigabytes of memory, plus four USB-A ports. The unit is an all-in-one design, which means that it is non-upgradable. The tradeoff, however, is that the unit is built to be quiet and have a smaller footprint than general-purpose eGPU enclosures. It is by far, the quietest eGPU that we have tested yet. This first version costs $699 but if you have a Thunderbolt display, like the LG UltraFine 5K, or the USB 3.1 type C LG UltraFine 4K, it's one of relatively few options. To go with a batch of Thunderbolt 3-equipped Macs during its October special event, Apple launched an updated "Pro" model of its existing BlackMagic eGPU. The biggest change is the inclusion of a more powerful GPU, this time the Radeon RX Vega 56 with 8 gigabytes of HBM2 memory. Externally, it is extremely similar in appearance and construction to the non-Pro version, consisting of an all-in-one aluminum enclosure. The connectivity options are also familiar, including two Thunderbolt 3 ports, four USB 3 ports, and a HDMI 2.0 port, but this model adds in a DisplayPort 1.4 connection. Apple will be shipping the Blackmagic eGPU Pro in late November, priced at $1,199. This is $500 more than the non-Pro version, but the performance increase in return is likely to offset the extra outlay for users who need that much graphical power. To make the Puck so small in size, Sonnet used an external power supply that is nearly as big as the Puck itself. The Mac-compatible model contains a Radeon RX570, which cannot be upgraded or removed from the enclosure. When looking at the size, the Puck box measures roughly 6 inches-by-5.12 inches, standing 2 inches tall. Even incorporating the external power supply, the unit is much smaller than any other eGPU we've tried, minus the next entry in this list. And, an optional VESA bracket will allow you to bolt it to the back of your monitor, if you want it out of the way. The Sonnet Radeon RX570 eGFX Breakaway Puck is available on Amazon or at B&H Photo for $599. I’m not very tech savvy but I’m curious will an e-gpu help with photoshop editing large files? Or is this more geared towards video and gaming? This is a really complicated question. In general, yes, but you'd see better results from Adobe products with Nvidia cards. But, Nvidia cards aren't officially supported. This helps some now with video. It'll help more in Mojave as Apple's support improves. The only thing I would say, is YES, the Black Magic, is an eGPU, but it ENTIRELY defeats the purpose, or should I say the extreme purpose of being an eGPU, and that is, you want a box you can easily UPGRADE to a better card down the road. I mean I would say wait till you can get an eGPU box that is "rated" level PCIe3 in it's bridging. And get one that you can upgrade 1-2 more times down the road. The Black Magic would be like getting a MacPro (late 2013), not in speed but in the fact you CAN'T upgrade. I might be wrong maybe you can RIP out the GPU in the BMagic? The Blackmagic isn't for me. However, at present, if you have a TB, TB3, or USB-C display, you literally have no choice in the matter. Fortunately, as this article shows, there are other options if you don't have a USB-C monitor, though. It doesn't appear that the GPU in the Blackmagic can be removed. Do you know which is the most powerful video card that can be use on setup, if the power is not an issue? Nvidia maybe? In regards to this list, on the top two enclosures listed, the Vega 64 is supported directly by macOS. The Nvidia 1080ti is workable, with hacks. There are workstation cards, and we're running some tests now to see how helpful they are, versus their cost. I really like the polish of the Blackmagic unit but wish it had a Vega (for longevity) for my forthcoming-but-still-non-existent Mac Mini with TB3. Then I can ditch my PC for gaming and go all Mac. Yup, they do good work. We've linked to them a lot. For anyone thinking of buying a GPU at the moment just note that Nvidia is having a gaming focussed event on the 20th. That guy with a pcie riser should fix the ultrafine needing a DisplayPort over usb-c, it’s what I use for my windows machine to use my ultrafine 4k. I know the sonnet box can fit and power it (it’s what I plan on doing with my MacBook Pro soon). As somebody with two Thunderbolt monitors is probably go with the black magic if I got an eGPU today. Having things like truetone on my monitors is awesome. I guess I'm not sure why you'd drop $200 on a PCI-E enclosure, $60 for this, on top of a eGPU and card rather than get the Blackmagic? I'm expecting more Titan Ridge controlled eGPUs before the year is out. Here’s my question if anyone can answer for me that would be great. I own the mid 2018 15 inch MBP with Core i9, 32GB RAM, 2TB SSD, Radeon Pro 560X. My idea is when Apple releases their own 5K display, I can use it on both macOS and Windows Bootcamp. In macOS, an eGPU would just help to drive the display more smoothly. But in Windows, I would love the eGPU to allow me to play games at ultra settings on 1920x1200 resolution. To push things forward, I would love the eGPU to be able to drive the 5K display AND game at 2560x1440 resolution. With that said, can anyone suggest a good AMD GPU and eGPU case that fits this purpose? We don't know for sure what Apple has planned for its own monitors. However, odds are that it will be Thunderbolt 3 alone. So, the only one at present that does that is the Blackmagic. Also however, I expect more eGPU enclosures to support USB-C and TB3 going forward, so in your use case, I'd wait a bit to see what develops. If you want to play ultra at 1920x1200 don't get one with a 580, get a Vega 56 or 64. The article above says which eGPU units have a power supply big enough for those cards. Also be careful to get an enclosure that will work easily under Windows. I'm not sure the Blackmagic one (which is really intended as a Mac only product) does. It looked like from my research that there was room in the sonnet for the card without the need for the pcie enclosure. So then it would just be 60 plus the cost of the riser (10 ish dollars). That is of course if you go with something like the Radeon 580 which only needs one of the 8 pin power connectors, leaving an extra connection for the riser. Having a PC and a Mac and sometimes needing to use the card in the PC is the reason I have this setup (my PC does not support Thunderbolt 3). Honestly, this would all be fixed by cards supporting USB-C/Thunderbolt 3 or having another 4k monitor over DisplayPort for my PC. I can’t live with having a non-upgradable card though, which is why the black magic won’t work for me. I had all sorts of difficulties with my one (in conjunction with 2017 MBP, external LG 4K monitor (not the Apple one) and Windows 10 1803). It had the wrong device name in Device Manager (just random characters). It could only accelerate the external monitor (the internal one shut off completely), whereas on the Mac side it could accelerate either with a Terminal command. And it was just generally unstable, sometimes I would have to plug and unplug it for it to power on (Windows would boot up with it plugged in but just never give it power). And sometimes when booting up Windows the login screen would show briefly on the external screen (like 2 seconds) and if I didn't press a key in that time the screen would turn off, and I had no choice but to hold down the MBP power button for several seconds and do a hard-restart. Honestly it was more hassle than it was worth. But it did work beautifully on the Mac side. So that's what my comment was based off, my own experience, but I know from your reviews that you also have one and there are so many variables with these setups that I don't doubt what you say, I just think one of these variables must have been different. Do you have a link to what you're talking about with this? There's only one PCI-E riser in the Sonnet box, and it would be occupied by the graphics card. I don't see how the card would get powered, as it seems to rely on PCI-E pass-through power. Is this Bootcamp? There are all kinds of oddities with eGPUs in Bootcamp.